From the Inbox: Where Does Your Garden Grow? We are about to purchase a house in Gilbert, Arizona that has an East-West exposure with the backyard on the East side of the house. My question is where should we position the vegetable garden that we are so eager to plant? We want to start out with one raised bed and see how it goes from there. . . . . . . . I'm sorry I don't have pictures to supply, we haven't moved in yet but I hope my descriptions get the idea across! Good morning Kelsey, and thank you for the detailed description; you did indeed get the idea across. I omitted some of the details you sent, because the answer is fairly straightforward and applies in every gardening situation. Whenever we prepare and plant a vegetable garden, we want to place it in a location where it will receive a minimum of six to eight hours of sun each day during the season in which the vegetables are growing. I could just say "put it where it gets 6 to 8 hours of sun," but in the Desert Garden our multiple growing seasons mean we need to think it through just a little further. In more northerly, and colder, climates, the main growing season is late Spring through Summer, and we simply put the garden in the area that gets 6 to 8 hours of sun from late Spring through Summer; sun patterns change throughout the year, but our gardening is limited to one period, so no worries. In the Desert Garden, however, we are growing vegetables year-round and a location that may be in full Sun in May is not going to be in full sun in October or January, so we need to plan accordingly. For your Fall and Winter garden, you'll generally need to find a location with a southerly orientation with no trees, walls, etc., to block the low-lying winter Sun. For your Spring to Summer garden, you have more flexibility and can generally plant to the North or to the South; an East-facing exposure may not get sufficient sun throughout the day, and a West exposure can be too hot for all but the very toughest of plants. 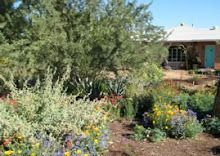 As you're in Gilbert, I am guessing that you have a Home-Owners' Association and will not be able to plant the front yard to a vegetable garden. So find the spot in the backyard with the best South exposure, free of heavy tree-shade, and place your garden there. And don't be afraid to place it smack-dab in the middle of the yard; there's nothing at all ugly or unattractive about a vegetable garden!